Emergency and ICU services remained operational, but all routine surgeries have been cancelled, out-patient clinics being run in a restricted manner. AIIMS strike has been called over alleged assault by a professor. 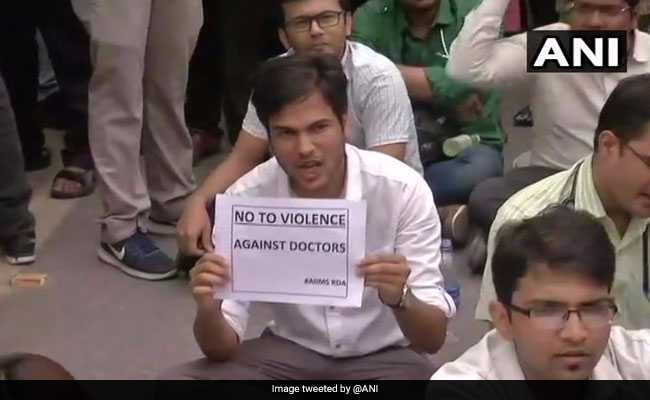 New Delhi: The strike called by the resident doctors of the All India Institute of Medical Sciences (AIIMS), after one of their colleagues was allegedly assaulted by a senior doctor partially affected healthcare services at the premier institute today. Emergency and ICU services remained operational, but all routine surgeries have been cancelled, out-patient clinics being run in a restricted manner and all academic activity and exams postponed indefinitely, a senior officer of the administration said. The hospital administration has put in place a contingency plan for patient care services, as a part of which faculty-on-call in all clinical departments will physically man the in-patient wards. "OPD services will function on restricted basis till such a time that normalcy is restored. Only follow-up patients with prior appointment will be registered in OPD. New Patients OPD registration will be done as per availability of faculty in respective OPD as decided by Head of Department/Unit concerned. No walk-in registration (new and old) will be done," the order by the administration said. Routine surgeries will remain suspended and only emergency cases will be taken up for surgery. Diagnostic services will function on a restricted basis as maximum possible for the faculty, it stated. "Head(s) of all clinical departments will make arrangements for round-the-clock availability of doctors of speciality concerned either from research staff or by the faculty members. Under no circumstances any inpatient ward will function without physical availability of doctors of speciality concerned," the order read. In a statement late last night, the AIIMS said the incident in question took place on Wednesday, following which the senior doctor apologised to his junior. Announcing the indefinite strike yesterday, the doctors have demanded immediate suspension of the senior doctor, who also heads a department at the premier institute. The Resident Doctors' Association (RDA) has also urged that the doctor in question should not be allowed to take in thesis candidates and conduct any kind of verbal or written examination. As a mark of protest, the doctors yesterday worked wearing helmets. They also sought a written apology from the senior doctor concerned. In a letter to AIIMS Director Randeep Guleria, the RDA alleged that the senior doctor slapped a senior resident in front of attendees, nursing staff and colleagues, and that the resident doctor was under depression and had gone home.